Excursión de 4 horas a bordo de un catamarán. Haga snorkel en dos lugares diferentes entre la vida marina nativa y el coral vivo. Almuerzo estilo hawaiano y dos cócteles. Comience con la recogida en los hoteles seleccionados de Waikiki a la hora de salida elegida (mañana o tarde). 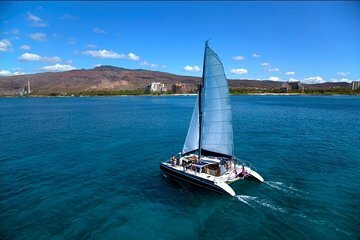 Suba al vehículo de la excursión para realizar un breve recorrido hasta el Ko Olina Marina and Resort, donde se registrará en el muelle y degustará algunos bocadillos, té, agua y café. Conozca a su capitán cuando suba a bordo del catamarán de 53 pies (16 metros) y salga a la primera parada del día. Mientras navegas, puedes relajarte en la cubierta y ver pasar el paisaje hawaiano o explorar el barco. El catamarán está totalmente equipado con una barra completamente surtida, un interior de teca y duchas de agua dulce. Hay un montón de espacio para que 40 pasajeros se desplacen y se sientan cómodos. Una vez que llegue a su primer destino, póngase una máscara y un snorkel y salte al agua, un hábitat conocido para los delfines de la especie. Flota alrededor del arrecife de coral en busca de vida marina nativa. Mejora con una excursión de SNUBA, una técnica que es una combinación de snorkeling y buceo. Después de dos visitas a los arrecifes, disfruta de un almuerzo al estilo hawaiano de hamburguesas de soja, pollo teriyaki y sándwiches de cerdo. Los huéspedes mayores de 21 años pueden tomar dos cócteles de cortesía junto con el almuerzo. Mientras el bote regresa a la orilla, disfrute del paisaje, tome un poco de sol o diríjase a cubierta para tomar una ducha de agua dulce. Una vez que regrese a tierra, devuélvase a su hotel de Waikiki. First time Hawaii vacationer here utilizing typical online tour excursions. The Catamaran sail and snorkel has been the highlight......the crew will go out of their to ensure you have the best experience. Captain Todd and crew went well above and beyond. Shannon, Mike, Dallas and Gilligan were consistently asking each passenger if they can get them anything or do anything for them. Adult beverages were provided in addition to plenty non alcoholic drinks as well. Lunch was served in the main cabin area buffet style with teriyaki chicken or pulled pork sandwiches with several side options.....very nice setup while cruising the Pacific as Turtles and Dolphins swam by. The snorkel gear was great, instruction clear and concise for us first timers and the fish were a plenty! Two different Reef locations were taken advantage of to ensure we had optimal fish viewing experiences. From hotel pickup to checking at the marina to cruising the ocean blue was exceptional! Thank-you Captain Todd and crew for this memorable experience. There are plenty of options for snorkeling cruises, but the staff, from the storytelling bus driver Henry, to the Captain and his three lovely, gracious, and hard-working crew women made this one a fantastic evening. We swam through schools of colorful fish, followed giant sea turtles, and spied whales on the horizon. We had a magical day, swam next to a green turtle, saw whales and dolphins. The crew were amazing, we had a wonderful cocktails and lunch. I had a great time, they are fantastic. The bus picked me at the hotel, the stops were good and the food too. We had a great experience on board! We were so lucky only other 4 people booked the tour for that day, so it was like an exclusive tour. Staff was incredibly nice. Food and beverage were very good as well. They took us to 2 different spots for snorkeling and both of them were amazing, one of the guys in the staff was actively looking for see turtles while we were diving and we got to see 2 of them! Their snorkeling equipment is pretty good. We highly recommend this tour! Terrific crew and catamaran. Everything was explained well. I hadnt snorkeled before but went really well. The lunch was goodies well. Beautiful boat, kind and attentive staff, you can't really ask for more! My husband and I work in the tourism industry and we were blown away by the customer service of the entire staff from the shuttle driver that picked us up in Waikiki, the checkin staff, all the way to the amazing crew on the boat. This experience made our trip! Loved it! Fun, relaxing and good snorkeling. Don't miss out on a Great Excursion. If your in the Ko Olina area this is the cruise for you ! We've been on this cruise numerous times during our visits to Oahu, it's always fun. Whether you're sailing with Capt. Daniel or Todd, they and the crew make you feel like family. They sail with a limited amount of people so your not stuffed on the boat, and engage their guests with passion. From novice snorkelers to the experienced, all will enjoy this trip. FYI-if you want the fish to eat right out of your hand take a package of frozen peas with you. Our trip went out on 4/16 Viator booking issue. The snorkeling was not so remarkable, but the boat and staff were terrific. A lovely day!